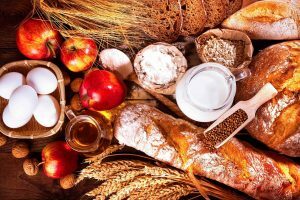 Carbohydrates are found in wide variety of foods, and carbohydrates (carbs) are associated with sugars in general. Starch and sugar are the important carbohydrates in our diet. Starch is abundant in potatoes, maize, rice and other cereals. Sugar appears in our diet mainly as sucrose which is added to drinks and many prepared foods such as jam, biscuits and cakes. Glucose and fructose are found naturally in many fruits and some vegetables.